Nonna has always taught us that baking is good for your mind, it’s creative and makes other people happy. LOVE – AMORE /AH-MOH-REH/ is the main ingredient for every recipe and this one has plenty of it. 1. Preheat the oven to 180 degrees. Grease and line a deep 20cm cake with baking parchment. Core and cut the apples into thin slices and soak them in a little water with lemon juice. 2. Using an electric mixer beat the egg whites until stiff and put them aside. Beat the yolks and the sugar until pale and fluffy. While still mixing add the butter, the flour, the milk, the egg whites, the yoghurt and the cinnamon. Finally add the baking powder and mix well. 3. Pour the mixture into the tin. Drain the apple slices and carefully place them with their skin up on the mixture starting from the centre towards the edges. Sprinkle some sugar. Have you thought how much food can have an impact on your memory? The taste, smell, and texture of food can be extraordinarily evocative, bringing back memories not just of eating food itself but also of places and settings. Food is an effective trigger of deeper memories of feelings and emotions, internal states of the mind and body. We all have food memories and this recipe from my Nonna brings back some of mine…..
…. I grew up on the island of Sardinia coming from quite a large family with lots uncles, aunts and cousins. We all lived very close and our family life was ruled by traditional meals and wholesome food. I learned to cook from an early age, cooking was like a game for us children, some days instead of playing with dolls, we used rolling pins and wooden spoons …. BEI TEMPI! Good old times !! I was around 7 years old when on a sunny afternoon after school I helped my Nonna make Ravioli for the first time. Making Ravioli was (and still is in our family) a proper gathering, so all my cousins, aunts ( and uncles too) would be there to help Nonna… actually Nonna would make it very clear that she was in charge and that everyone had to follow her instructions. Apparently I was spending more time in tasting the filling and playing with that edible play dough than kneading the dough and filling the pasta. For a little girl that was all that mattered at the time! and that recipe is a memory that I will treasure forever. You can read her beautiful story all in Italian in Chentannos. 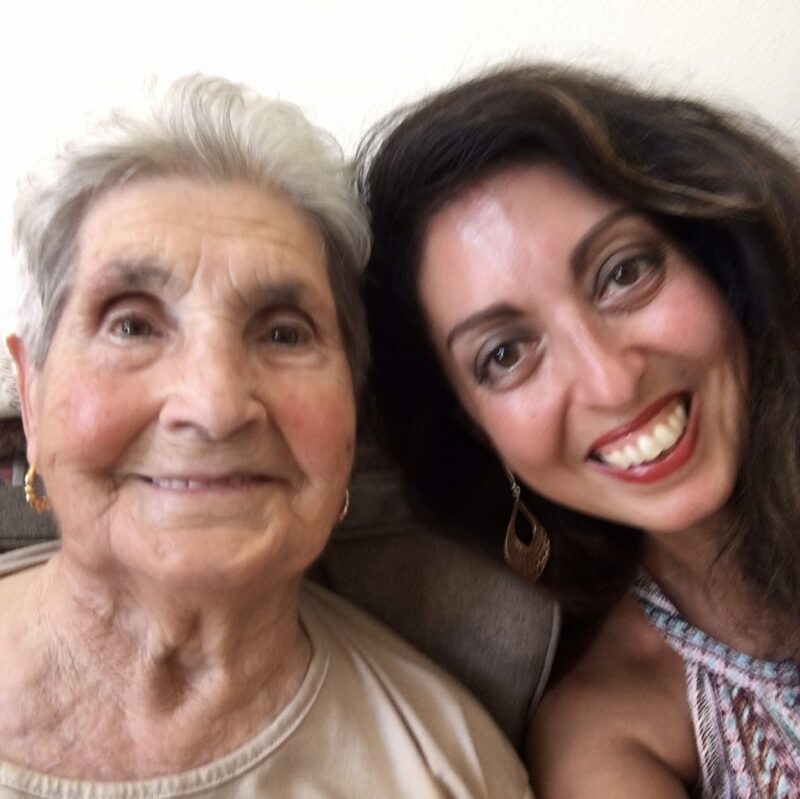 Thanks to the amazing Laura Mele for bringing back the memories of the centenarians in Sardinia. In a large pan put the olive oil, the onion and some of the basil. Put it on the heat until simmering. Add the passata, a pinch of salt and cover with a lid, cook on a low heat for 10 minutes. Add the rest of the basil before serving. Now pour the sauce on your ravioli , sprinkle some parmesan and enjoy !!! Nonna has always taught us to eat as many vegetables as possible and no many people are familiar with aubergines, please give it a try and let Nonna know what your feedback is 🙂 this recipe is just perfect for everyone to be eaten hot or cold. Preheat the oven at 190 degrees. Slice the aubergines length ways (1/1.5 cm thick). Place them on a non stick tray, sprinkle a pinch of salt and some olive oil (the olive oil keeps them moist). Bake for 15 minutes. Turn the aubergines over and with a teaspoon place the breadcrumbs evenly on each one. Add a little more salt and bake for another 15 minutes until golden.